Yusuke Kozaki (コザキユースケ) is a Japanese artist and character designer having drawn for manga and video games. 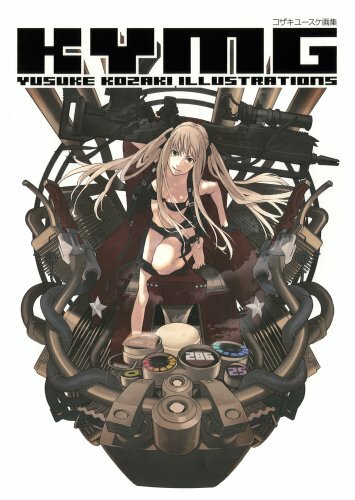 This 125-page paperback art book collects some of his work from Kyoko Karasuma The Detective of Asakusa Police Department (烏丸響子の事件簿), Speed Grapher, The Digital Anthem, Bakumatsukikanasetsu Irohanihoheto, No More Heroes 英雄たちの楽園 and some more. The manga style drawings are very beautiful. The character designs and poses are stylish, especially those from No More Heroes. I love the composition for those from 烏丸響子の事件簿. All the illustrations are in full color with the exception for the few comic panels included. Nice book for those who like the manga style. You can check out more of his work at kymg.net, which is actually a blog.